Today’s thriving St. John’s community has roots that go deep into the history of this area. St. John’s was established in the 1760s by Sir William Johnson, the founder of Johnstown. Sir William Johnson was brought up in the Church of England before he left Ireland to take charge of the estate of his uncle, Sir Peter Warren, along the Mohawk River in the Province of New York. Abundant evidence shows that he wanted all the people in the settlement he was establishing to be churched. The first church was erected in the southwest corner of what is now known as the Old Colonial Cemetery on Green Street. Its location is marked today with a stone cross. This church is mentioned in records of St. Patrick’s Lodge from 1766. In a note for the Society’s records dated 1774 we read, “The Society with great satisfaction observes the happy effect of that worthy person’s (Sir William) steady attention to the concerns of religion. Under his influence, the membership of the Church of England has increased in this neighborhood from 40 to 240 families since the year 1760.” Notes also indicate that the Society was grateful to Sir William for appointing missionaries and catechists to the Indians. By 1770 the community had outgrown the little stone church. In a letter to the Rev. Dr. Barton dated February 28, 1771 Sir William wrote, “The only mission in this quarter as yet supplied is mine in Johnstown, the church at which being small and very ill build, I am preparing stone and materials for erecting one much stronger and larger that will accommodate near 1,000 souls.” Work began early in March 1771. This second church was erected on the same site as the current St. John’s. It faced north with the entrance from the south (currently Church Street). The second St. John’s had an organ, a gift of Sir William costing 100 pound sterling, which was famous in the area. Records also note a “wonderfully toned bell” hung in the belfry. This was also the gift of Sir William and was the first bell west of Albany and north of the Mohawk River. It is said that a wide band of red paint extended around the church, to show the Indians that they were welcome to services. When Sir William Johnson died, he was buried beneath the altar of this church. 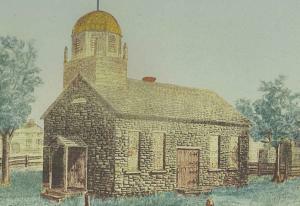 While a missionary from Queen Anne’s Chapel at Fort Hunter initially served the church, in 1772, The Society for the Propagation of the Gospel granted St. John’s 25 pounds for the support of a clergyman. The Rev. Richard Mosely became St. John’s first permanent Rector. With Sir William’s death in 1774, his son, Sir John Johnson came into possession of his father’s title and property. In the turmoil of the Revolutionary War, Sir John’s property, including the church and its glebe (no deed having ever been drawn to the congregation by Sir William), was confiscated when he and nearly all of the prominent church people fled to Canada in 1777. It was not until some time after the conclusion of the war that the abandoned church was reopened and used by the Presbyterians and Lutherans. These congregations continued to use the property until 1793, when the legislature of New York State passed an act which granted the stone church and glebe to the trustees of the Presbyterian Church, reserving however, the use of the church for eight Sundays a year to the Episcopalians and Lutherans. In 1796 the Episcopalians, an incorporated body, appealed to the legislature for the return of the title to the church and property, and by special act in 1798, the legislature granted their plea. The Parochial records of St. John’s prior to 1815 have been lost, but beginning with that year they are intact, including complete minutes of the vestries. St. John’s second building was destroyed by fire on November 26, 1836. A vestry meeting was held the same day to prepare plans for a new building. The cornerstone was laid on April 15, 1837, and the new building was consecrated on October 15, 1837 by the Rt. Rev. B.T. Onderdon, Bishop of New York. In 1909 the present chancel and Parish house (now known as the Hawkins Room) were erected, while a third floor was added to the Parish House in 1953 to accommodate the growing Sunday School. Because this building faces in a different direction, Sir William Johnson’s grave now stands outside of the building. The modern St. John’s reflects our history in many ways. Though the church is no longer surrounded by a red band to welcome Indians, outreach to the community, the nation, and the world are a driving commitment of the St. John’s congregation.